Forever’s aloe bio-cellulose mask provides potent, energizing hydration using forward-thinking technology and natural ingredients. At the heart of this next-level mask is a bio-cellulose fiber. This material easily fits every contour of your face, allowing the mask to penetrate deep into fine lines and wrinkles traditional sheet masks fail to reach. 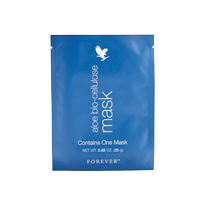 The aloe bio-cellulose mask provides dual-phase benefits. Through a process unique to Forever, a special bacteria naturally ferments aloe vera gel from our own plantations and seagrass then fuses them into bio-cellulose fabric to soothe, soften and condition skin. In addition, a serum enriched with green tea, and horse chestnut rejuvenates dull skin, helps fight free radicals to help combat the signs of aging and soothes to reduce the appearance of redness. That’s two incredible tasks from just one mask. Our bio-cellulose mask is easy to use and requires no rinsing. Simply massage the remaining serum into your face and neck. Because bio-cellulose allows the serum to penetrate many times deeper than traditional masks, you'll feel the powerful hydration much longer after use.